Synopsis: Miriam was an ambitious business journalist in Boston. Until she was fired—then discoverd, to her shock, that her lost family comes from an alternate reality. And although some of them are trying to kill her, she won’t stop digging up secrets. Now that she knows she’s inherited the family ability to walk between worlds, there’s a new culture to explore. Her alternate home seems located around the Middle Ages, making her world-hopping relatives top dogs when it comes to ‘importing’ guns and other gadgets from modern-day America. Payment flows from their services to US drug rings—after all, world-skipping drug runners make great traffickers. In a land where women are property, she struggles to reman independent. Yet her outsider ways won’t be tolerated, and a highly political arranged marriage is being brokered behind her back. If she can stay alive for long enough to protest. Review: I had a good time with the first novel that compiled the first two volumes and I was curious to see what the author would present us for the following events. I must say that he did a pretty amazing job. Oh yes because he has not only created a world, but three very different along with the characters who continually visit them. Besides, it goes without saying, but we have a lot of different actors in view with this big organization and it is always fascinating to see how they interact together. Since Miriam found herself propelled into this new world, the troubles are only accumulating. Even if she thought that she had found a way out by presenting a new business plan to the clans while using another source of profit, nothing happens as expected. The attacks against her are not finished, no one in the family does trust her and Miriam finds herself all alone, forced to stay where they want her to be. And when things work out just even a little bit, her curiosity degrades the advances she had won. But now, the clans want to have a means of pressure on her, especially since they realized that she had a lot more resources than they thought. The solution to keep her under control? Marrying her course! And what a better way than to choose the « idiot » son of the king, so she will take charge oh him and of course will have to bring his children. You can imagine that Miriam with all her progressive ideas does not like to be confined, much less to be forced to do something against her will. And this wedding? This is something she just hates the idea and we can understand it. Yet the clans here also know how to tip her in their favor by threatening her mother … No, our beloved heroine has no loopholes, but that does not mean she will make things easy either for them. I enjoyed seeing our young lady evolving, discovering her next actions despite many obstacles and of course trying to manage everything without really knowing how to do that. She has to go through many things I have to say and I was really surprised that she gets to keep going with this. New characters enter in the scene and we follow them alternately in the chapters. Mike and Lee are the two that intrigued me the most and I must say that I am curious to see what will happen to them afterwards. I must admit though that I was personally still waiting to find Miriam again as she always interests me more than the others, but everything was very well done. Many events are moving in the shades and they will have a great impact on the main story. So it was again a great surprise and I am very curious to read the last two volumes of the series at present to see how the story concludes. 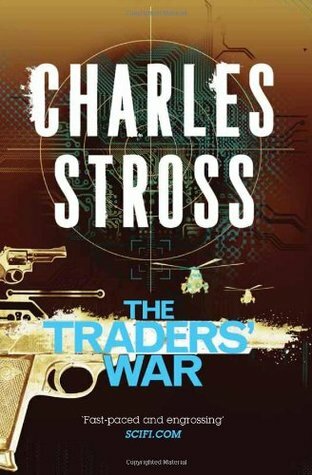 This entry was posted in Charles Stross, Fantasy, Science Fiction, The Merchant Princes. Bookmark the permalink. Waah cette saga a l’air vraiment bien !! Je pense me le procurer bientôt ! Merci pour la découverte ! i love that each book has a different world but the same characters. So glad the books are more amazing each time..you have to love when an author can do that. Wonderful review! AH no sorry if I didn’t explain right. It’s just 3 worlds in the same book, not one world per book. It’s what is impressing. This isn’t one I probably would have picked up but I am so glad you liked it. Sounds good! That’s cool that each book has two volumes, easier to get through and much more satisfying. No cliffies too! yes I love that, and it’s not so big so it’s pleasant to read it too. This sounds really interesting – I’m intrigued! Haven’t heard of this one but I am interested, it’s not something I would ordinarily read. it’s different and complex but that’s what is awesome. Sounds Dr. Who-ish kinda. 😉 It sounds like an interesting read! Three different worlds? Holy crap, how do they keep up with what they write??? I would get so lost! lol 🙂 Great review! yes it’s quite impressive but he did an amazing job for that. Sounds like Miriam goes through some serious character growth, but holy crap I would not be able to follow this book, haha. no it’s ok, really, it’s perfectly done for that. No I don’t think so. I really hope you’ll like them. I hope you’ll like it if you try it Jessica!